I was house hunting recently, which as many will know is possibly one of the most exhausting activities known to man, both mentally and physically. After looking at the 5th straight apartment in under two hours and traipsing halfway across town (a new town I might add... But more on that at a later date) we had a half hour window to catch our breath. Luckily a good pub was close to hand, but what to have? Obviously nothing too strong, as I needed to keep my wits about me for 'the hunt', and something which is refreshing but also not too bitter. I don't know about you, but when I'm just having one quick pint as a thirst quencher, it isn't the really hoppy beers that I look to. Anything with too much of an after kick will just make me more thirsty ten minutes after I finish it - a nice crisp golden ale is fine but anything even approaching IPA in the IBU stakes is a no go. In these situations the drink that I really want is a proper, old school, totally unfashionable, mild. 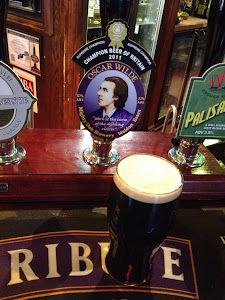 This time around it was Oscar Wilde (mild), which fitted the bill perfectly. It's the beer that was announced as Champion Beer of Britain in 2011 to many a beer geeks guffaw of "pah, a mild", yet it's one I've never had the chance to try, and as such I reserved my judgement. Best beer in Britain? Pushing it. One of the best traditional British milds? Absolutely. In terms of ticking all the stylistic boxes and doing exactly what a good mild should, this beer knocks it out of the park. Refreshing in a satisfying and thirst quenching (rather than weak) kind of way, but with loads going on in terms of flavour: Milk chocolate cocoa, faint roasted coffee and a blink-and-you'll-miss-it bitterness that keeps the lightly sweet malt backbone in check. It's a little stunner, and at 3.7% abv fits the 'genuinely refreshing' requirement quite nicely. But isn't that the point? Doesn't CBOB look at the scores from the individual category winners and the highest scoring become CBOB? That's how completely different styles can be compared fairly if the marked to style in a similar way across all styles, the scores should be comparable. and of course its very much down to which beer was received best on the day, by the people who were there.